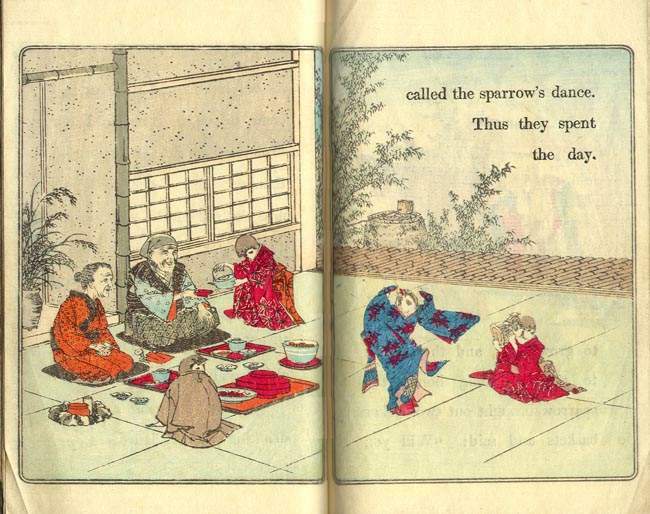 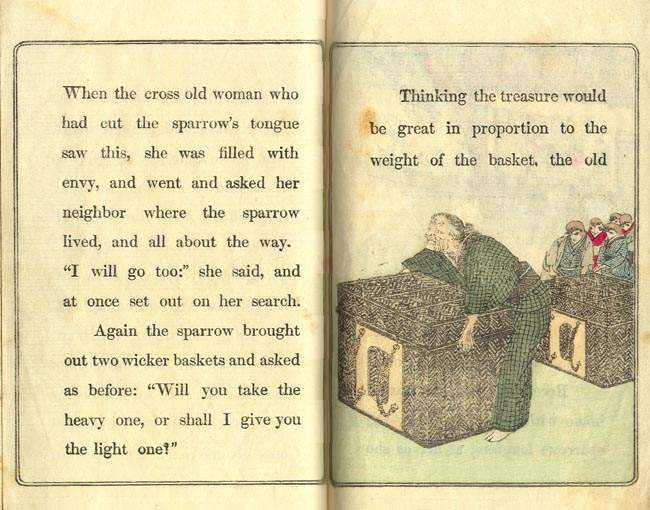 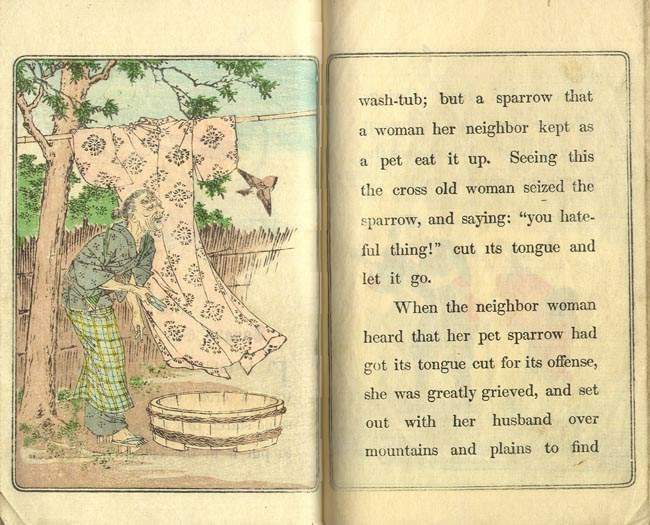 Shitakiri Suzume (The Tongue-Cut Sparrow), No. 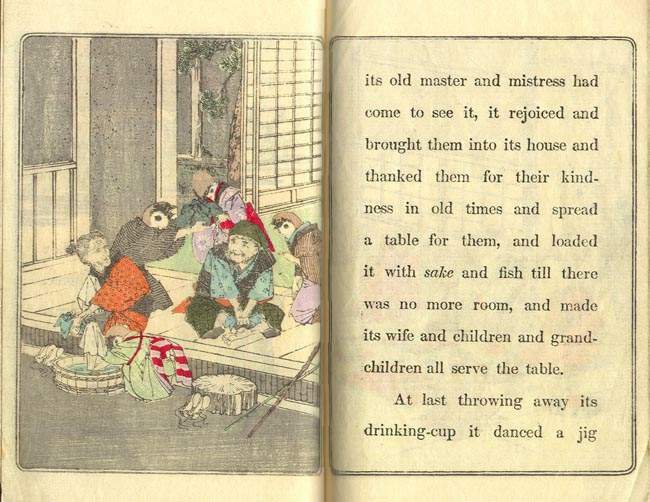 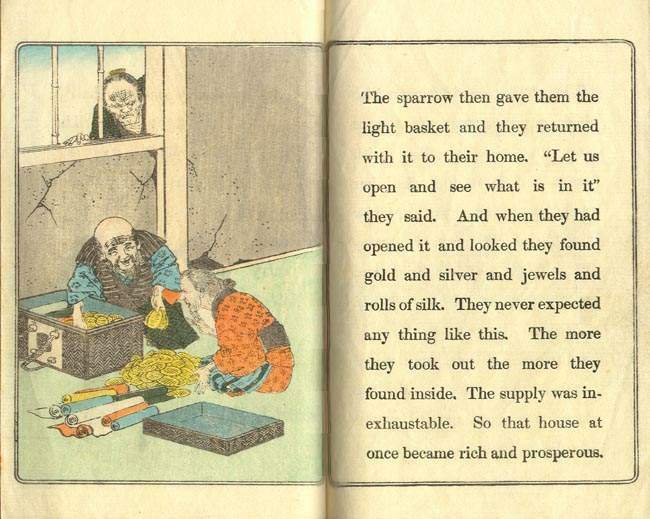 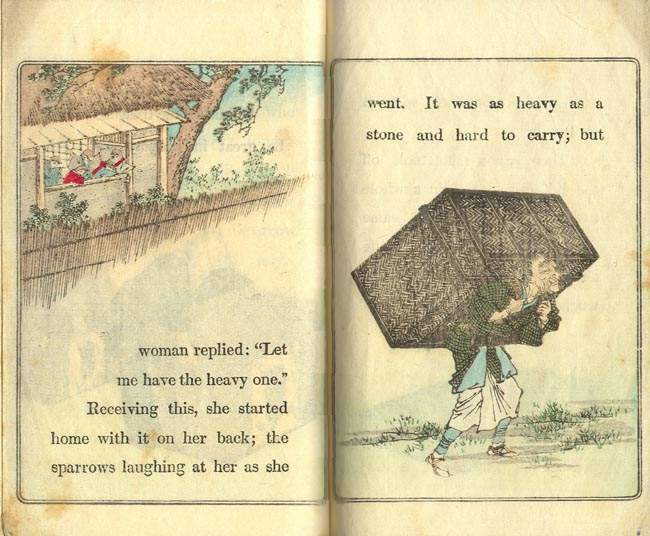 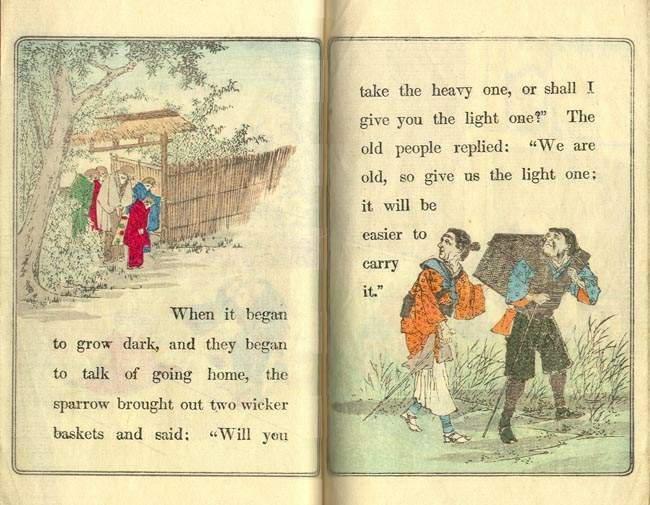 2, Japanese Fairy Tale Series (English), Meiji 18 (1885), Tokio (No. 2 Minami Sayegicho), Kobunsha imprint, first edition, first printing, title on cover is in phonetic Japanese (transliterated) rather than translated into English, English title (The Tongue-Cut Sparrow) is stated on the first page, medium size for a Hasegawa/Kobunsha book, 12mo (4 7/8 x 7 1/4 in - 12.5 x 18.2 cm), plain paper (not crepe) in folded sheets, spine not covered, string or silk stab ties, 22 pp - 11 folded (including covers). 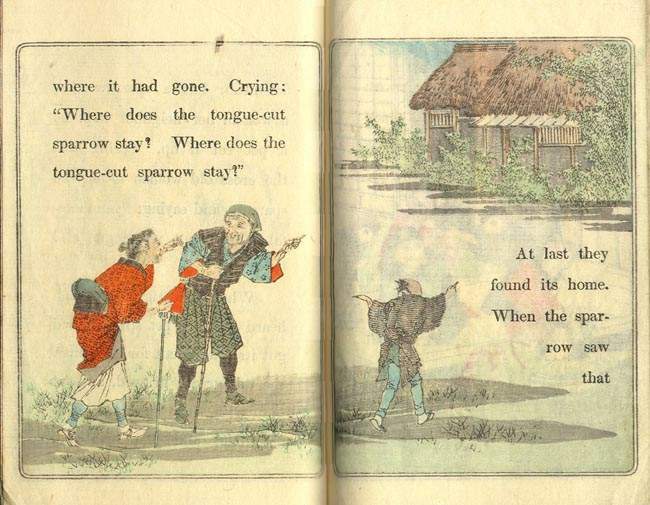 This format book (phonetic Japanese title, plain paper) is considered by many to represent the true first edition of the early Hasegawa fairy tale books. 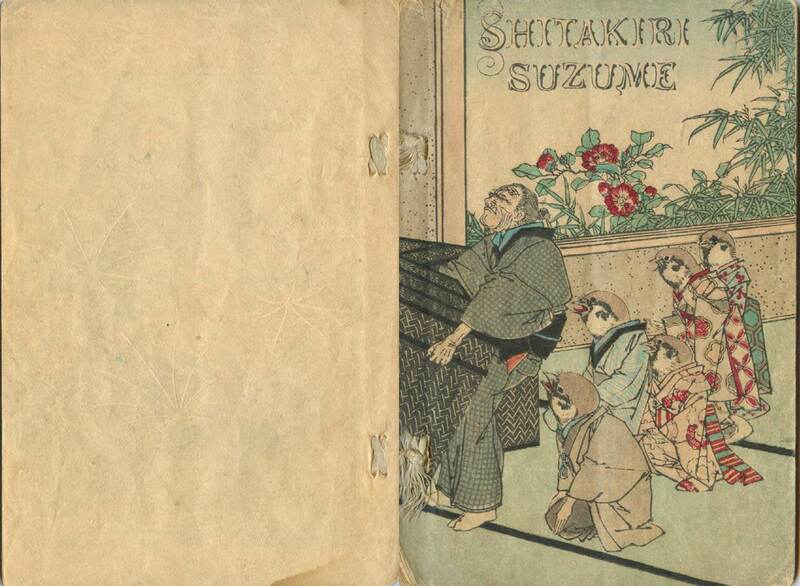 Sensei Eitaku was the artist who created the illustrations. 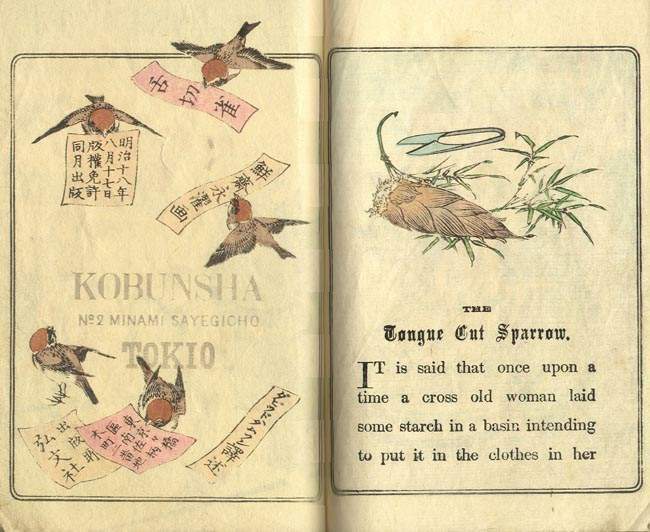 Translated from Japanese to English by David Thompson. 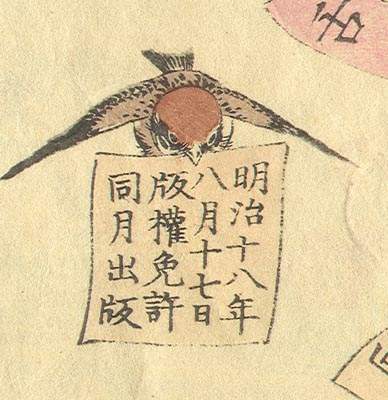 The colophon indicates a printing date of August 17, Meiji 18 (1885) and a publication date that same month. 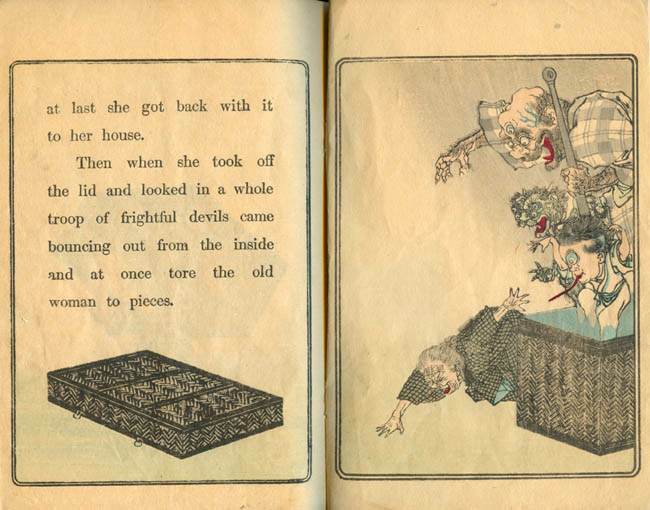 There are two major varieties of the first printing (plain paper) of the first edition. 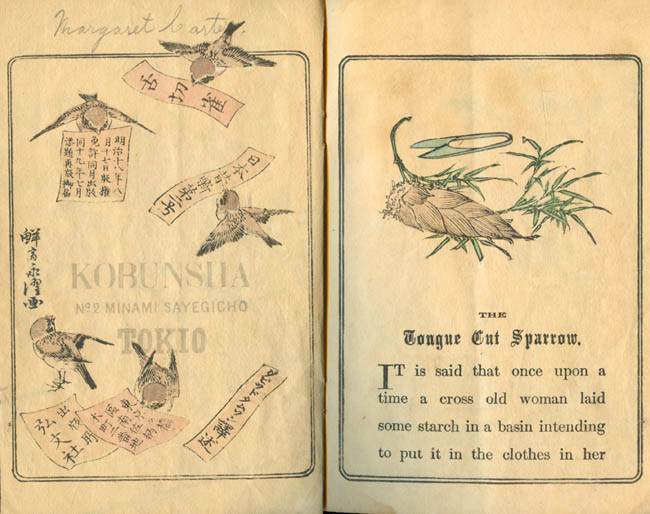 I call these Varieties A and B. 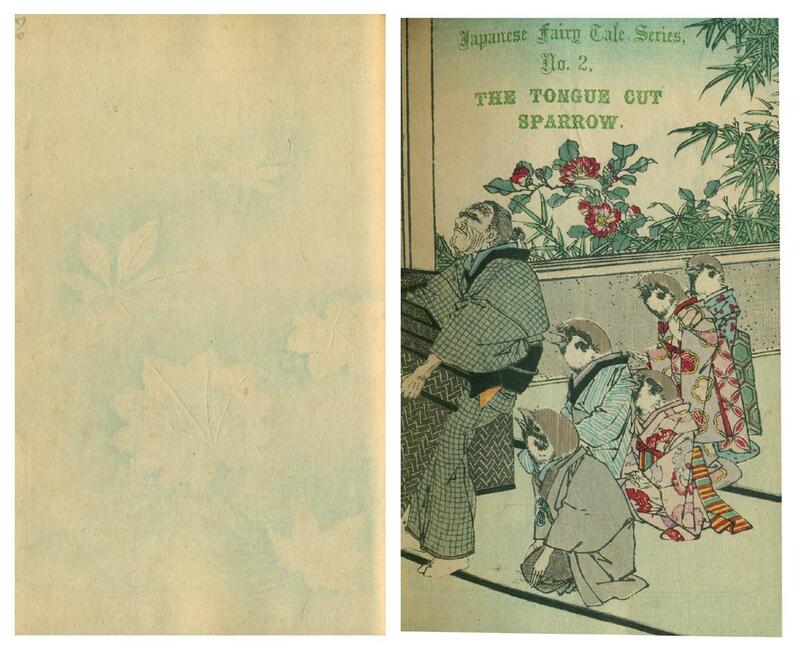 They are almost identical except for the image on the inside of the back cover. 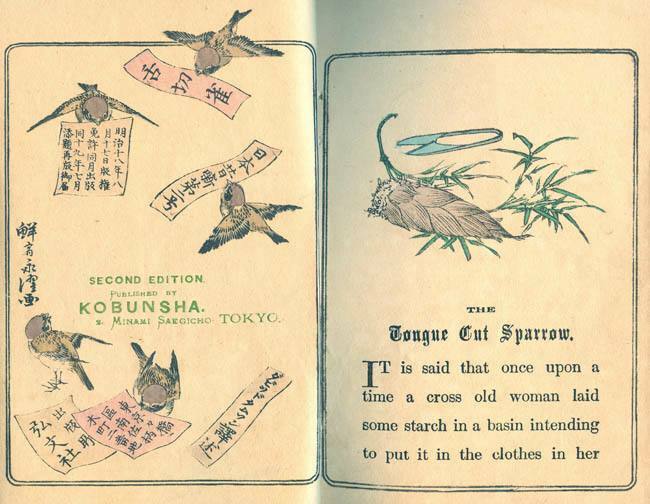 Cover Title: Transliterated and no Japanese Fairy Tale Series (Type A). 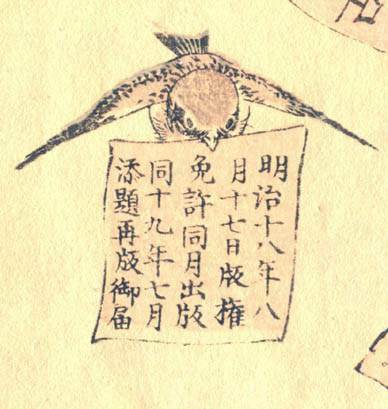 Colophon: Carries only the date of Meiji 18 (1885) in the colophon. 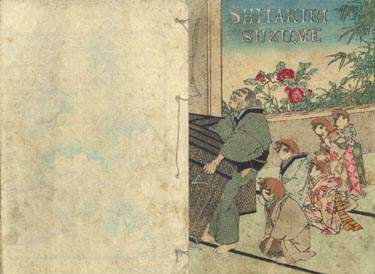 Inside Back Cover. A small devil is present over the old lady. Inside Back Cover. 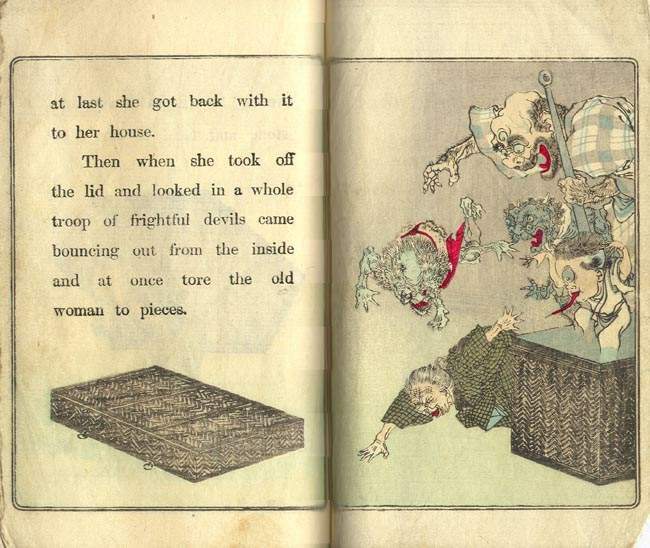 Missing the small devil over the old lady. 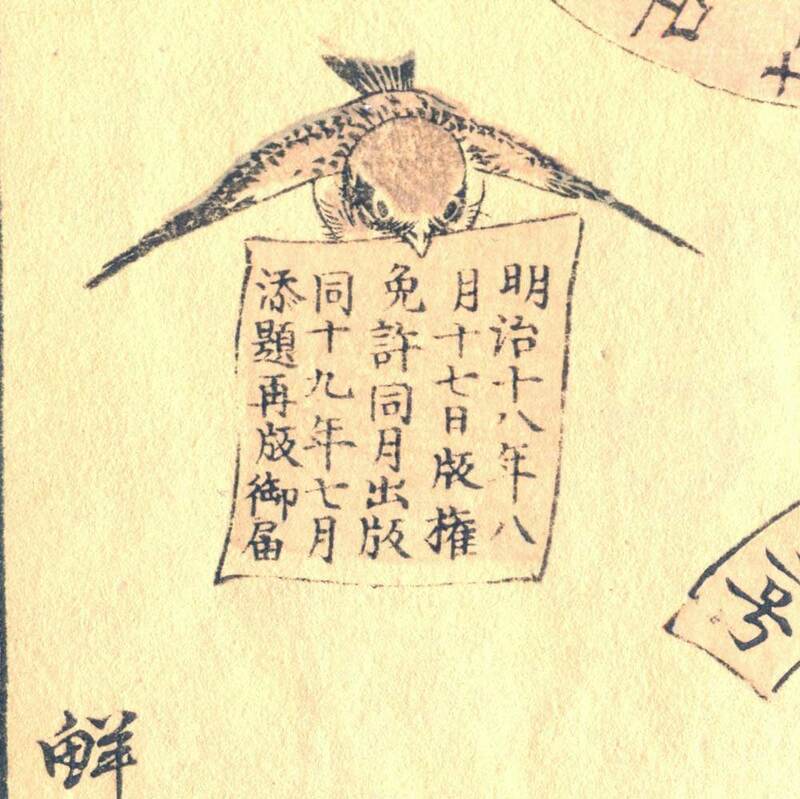 Colophon: Carries the additional date of Meiji 19 (1886) in the colophon. 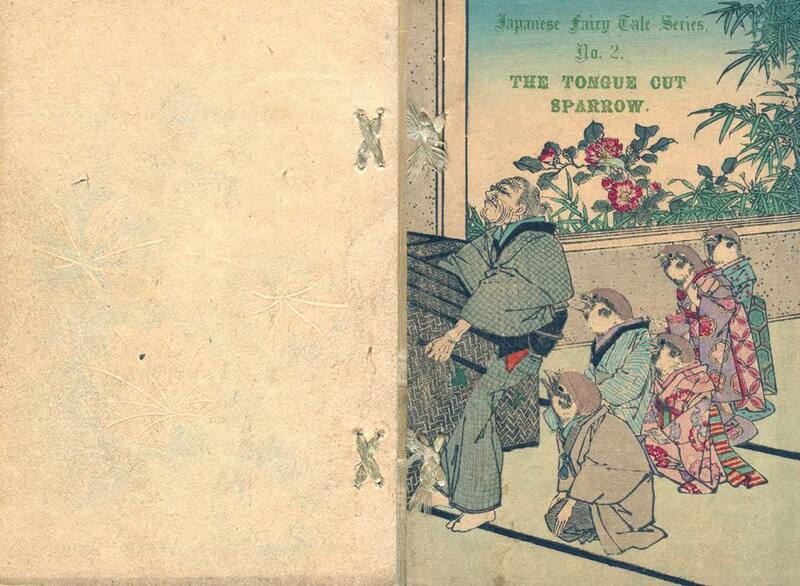 Cover Title: Translated and carries "Japanese Fairy Tale Series, #2 (Type B). 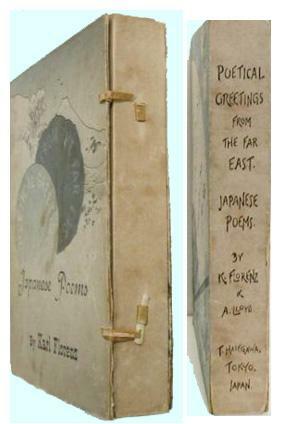 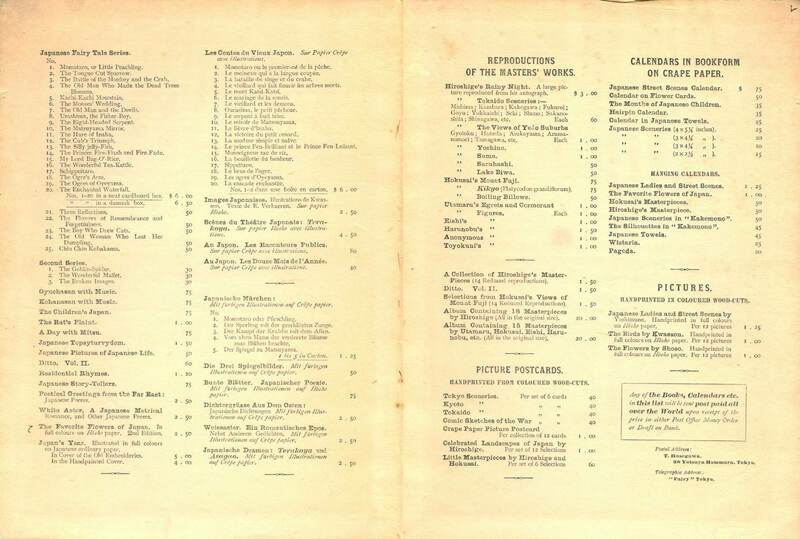 Second Edition: "Second Edition" stated on the page inside the front cover.